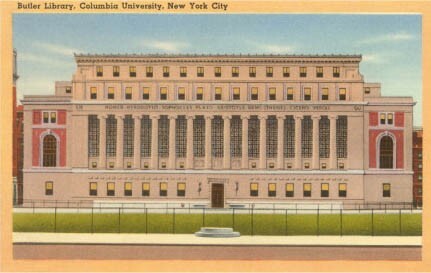 The University Archives, a unit within the Rare Book & Manuscript Library, preserves the institutional memory of Columbia University through the acquisition of official University records and related historical collections and materials from its founding in 1754 to the present day. To access all of our cataloged archival collections, search our Archival Collections Portal. The Columbia University Archives staff has put together some Research Guides to help you take advantage of our holdings. For each type of search, you will find the most popular resources available and how to access them: some online and some in person. The guides focus on alumni, faculty, course descriptions, Master's essays and dissertations, and buildings and grounds information.